Utagawa Kuniyoshi (1797-1861) Yendo Musha Morito holding the Head of Kesa-gozen among Falling Maple Leaves, 1840. Oban. Throughout his long career, Kuniyoshi made numerous designs which appear to be part of a series but which were produced at intervals of several years. Anomalies exist whereby designs issued late in his career were clearly drawn and conceived many years before. The Kuniyoshi authority, B W Robinson gathers these prints together under the general heading: 'Single Sheet Prints in Series'. This print (S1e6 in Robinson) is an example of one such anomaly. The indicators of a series are evident - the single figure portrait with elaborate cartouche (usually containing series information) and the overall design suggest a multiple edition. 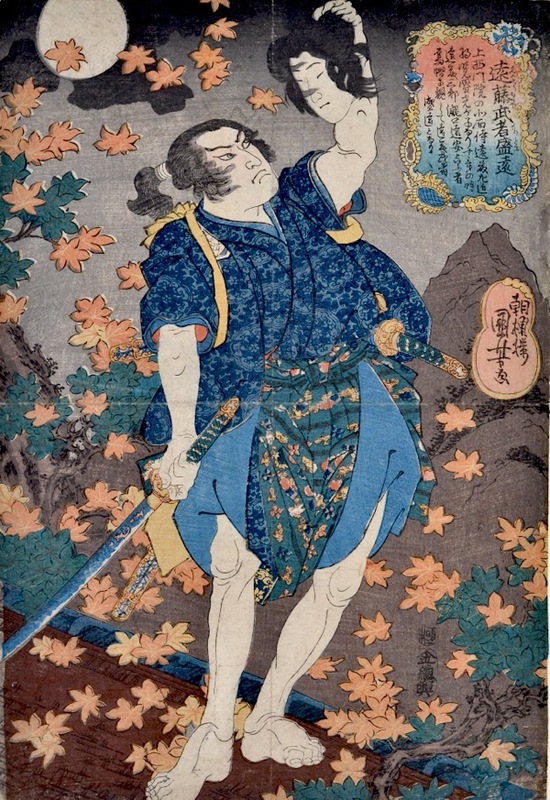 This unusual print stands alone however and illustrates the samurai Yendo Musha Morito holding the head of Kesa-Gozen, standing among falling maple leaves. This is a classic Kuniyoshi composition, gruesome and assured. Beautifully drawn, especially in the muscular treatment of the legs. The impression and colour are fine, the condition is very good with a slight centre fold.